A rural poor man is picking up the wheat grain from Cow dung. That is the alarming position for the life in drought region. When we think about Drought, immediately a book’s name arises in our mind. 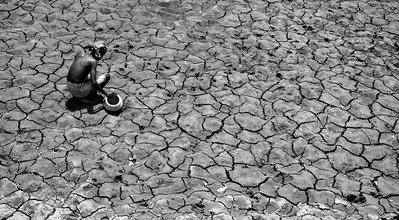 That is ’’ Everybody loves a Good Drought”– -By P. Sainath. Its Hindi version is available in the Name of –Tisri Fasal. In that book there is mention about the drought situation of Palamu Dist. (Jharkhand). A rural poor man is picking up the wheat grain from Cow dung. That is the alarming position for the life in drought region. Now a days temperature increased up to 45-46 degree in the Jharkhand. People are affecting by heat wave Children, women, old age people and cattle are victim of this drought. State Govt. has announced Drought in all 24 distt. Of Jharkhand. There are around 32000 villages in the State. In most of the villages there are paucity of waters. Wells are dried. Tube wells have failed. Actually Drought is men made calamity. This is the outcome of deforestation and decrease water table. According to water science not even a single drop of water is reduced from the earth. But decreasing water is due to mismanagement and unchecks of water system. Last week a youngman named Naresh Gope(Cattle keeper) of Purnanagar Village ( Giridih) committed suicide, due to water problem. He had taken Rs.70 thousand loan from moneylender for the installation of Borewell. It bored to 700ft.depth but not even single drop of water come out from deep boring. Disappointed cattle keeper lost his life. In few villages’ cattle was found dead due to lack of water and fodder. In this situation govt. has started some relief work. In few villages water is being supplied through tankers. NREGA worker can get 150 days’ work (instead of 100 days) in drought prone area in a year. MGNREGA (Mahatma Gandhi National Rural Employment Guarantee Act) is an ambitious programme of UPA-1 Govt. More than 5cr, worker got employment from this scheme. At first Modi govt. was against this Act. Last year Prime Minister Modi talked against MGNREGA in the parliament. He told that MGNREGA is a monument of failure the Congress Govt. This is the digging ditches programme. But Modi same time forgets that each and every Pillars of parliament (in which he enters first time in life) is constructed by labourers (by digging the ditches). Now the labours working under NREGA are unhappy and disappointed with Govt. policies. Average rate of the worker is normally Rs 212 in Jharkhand. But Govt increase only Rs 5.Last year rate was 162, now it is Rs.167 from April.2016. This is nothing but cheating with the labourers. Last day May Day was observed on 1 st may in Manika Block of Latehar Distt. Many NREGA labourers were present. This was organised by Gram swaraj Majdoor Sangh, Manika ( Latehar).Prof.Jean Dreze( Economist and founder of NREGA) was also present. Media Convenor Mithilesh Kumar said that Big business houses is being exempted more than 3lacs Cr.Tax .Prof.Jean Dreze ( Economist &amp; Founder of NREGA) said that this slight wage increase is cheating with the labourers ,when all Jhrakhand is Drought prone area, There is food and fodder crisis in the State. Wages should be Rs 300.00. All the NREGA labourers who were present in the meeting unanimously decided to return Rs 5 to Prime Minister Modi. Many workers has started to send Rs.5 to Modi through Post office. It was the unique decision. State Convenor of NREGA watch, James Herenze said that if there is paucity of funds to Modi govt, Nrega worker will give him. For the purpose of relief work State Govt, has taken initiative to dig the Dobhas( like ditches) for the conservation of water. Around 1.3 lacs Dobhas will be constructed throughout the state. In each village one or two Dobhas will be constructed. But there is contradiction implementation. Deptt. of Agricultur the, Jharkhand Govt. will construct the dhobas through JCB machines but Dept. of Rural Development will do it by the NREGA Labours. Four types of Dhobas will be constructed. Beneficiary farmer’s will have to contribute only 10%. 90% will be supported by the Govt. Long term strategy is needed to meet the challenge of the Drought.